It has been proven that the use of video content in an Email Marketing strategy increases openings, clicks, and conversions. As can be seen in this article, according to a Syndacast report, emails with the word “video” in the subject line have an average increase in opening rates of 19%. And that’s not all! An article by the Content Marketing Institute provides an impressive statistic: 76% of those who put videos in their emails get much higher click-through rates, in addition to recording prospects’ greater propensity towards making a purchase, quantified at 72%. So far, so good. However, some complications arose when we got to work. If up to today we had to be cautious of possible issues with how the videos were displayed, today we are delighted to introduce a small, but important, novelty in the MailUp platform which allows you to insert a video in an email and automatically create its preview. All of this has obviously been optimized for mobile. To give you an idea: this is a post that we wrote several years ago, taking care to update its contents periodically. The article seems to infer that adding a video to an email was only something an IT engineer could successfully do. But today we can finally tell you that inserting a video in your campaigns really is a simple copy and paste operation. But let’s take a step back. Why are there still very few videos in emails? The answer is simple: the result does not always meet expectations. Most often this is due to a technical issue: many email clients do not support this format, thus causing a negative user experience. Furthermore, it is difficult to analyze results because it is impossible to track how many times the same user has viewed the video, pressed “play”, pause, etc. With MailUp, all of these problems are eliminated. 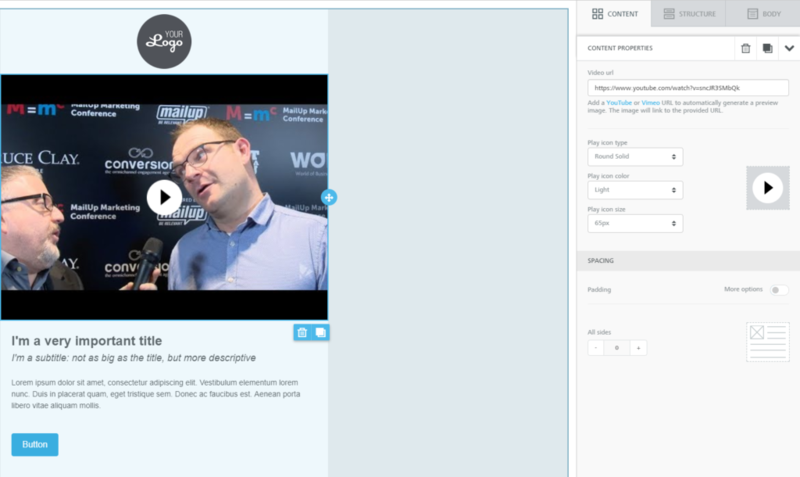 Our platform integrated drag-and-drop email editor BEE allows you to add video content to your messages without having to enter any embedded code, thus avoiding all the above problems. To create the preview in your creative content, all you have to do is copy the URL of a video in YouTube or Vimeo and paste it into the Video block. That’s it! BEE automatically takes care of everything else: it retrieves the video preview, inserts it into the template using the cover image, and adds the Play icon. Now that most of the work is done, all that’s left to do is the small stuff, like customizing the Play icon to make it as visible as possible to your customers! Below are all the details for carrying out the necessary operations. BEE is a drag & drop editor, which means that the email is composed by dragging and dropping various elements. So the first step is to select a Video content block and drag it into the body of the email where you intend to place the video. At this point, go to YouTube or Vimeo and copy the URL of your video, then go back to the MailUp platform and paste the URL into the corresponding field within the Property content menu. BEE will automatically generate the video’s preview along with a Play icon. 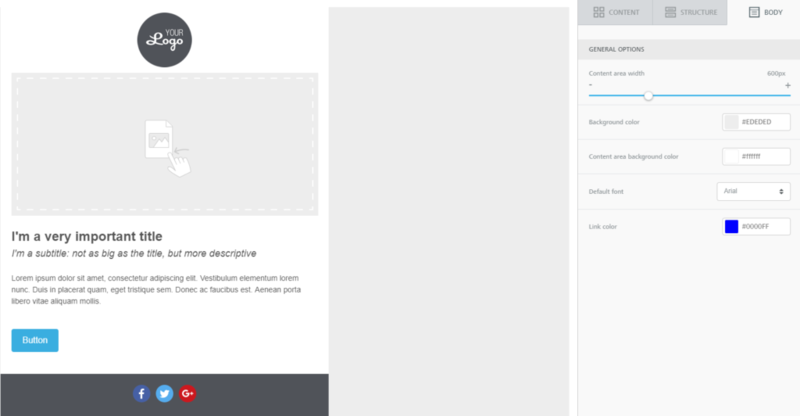 The Padding, that is, the margins of all of four sides of the preview. Videos are not the only resource marketers have for dynamically boosting emails. GIFs, countdowns, and animated images must not be underestimated. The trend of adding animation to emails can be further explored in the dedicated post Bring your emails to life with video: how-to, pros and cons: why and how to give a dynamic boost to messages in order to increase opens and conversions. Email design and dynamic elements: this synergy is what leads to the conversion potential of Email Marketing!